The University of Warwick is located approximately three miles from the centre of Coventry (not in Warwick). General information about how to get to the University, including transport links from airports and surrounding residential areas, can be found here. Information for international visitors can be found here. 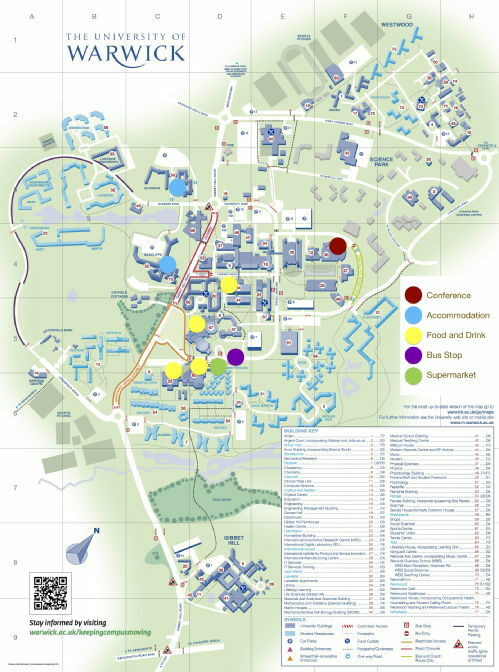 Below is a map of central campus with the most relevant areas clearly marked (you can also download it following this link. There are two ways of getting to campus. The first is by travelling to Coventry. There are number 12 and 11 buses from Coventry railway station. Remain in the station and take the outside steps by the car park to the bus stop. These run roughly every 15 minutes, cost between two and three pounds and will take you to the University in about 15 to 20 minutes. Exact change is needed on this service. If you are travelling by car, take the A46 to Coventry from the motorway. Do not turn off at Leamington Spa or Warwick – the University is located on the outskirts of Coventry. Follow signs for Warwick Arts Centre (our cinema and theatre complex), which is clearly signposted about one third of a mile before the turn off. At the turn off, stay in the left hand lane which takes you left only. Keep following Arts Centre or University signs for the next 10 minutes and you will arrive at the Warwick campus. There are various pay-and-display car parks available. There is a taxi rank on central campus, next to the 'Rootes' supermarket.